If you find yourself digging a lot of trenches, the best trenching shovel can be an absolutely invaluable tool. It is specially designed to help you quickly and easily remove the soil that’s left in the bottom of the trench so you get a smooth finish. There are dozens of different brands, shapes, and size trenching shovels available. This can make it easy to get overwhelmed when you’re looking for a good one. 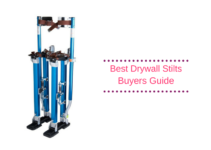 If you’re not sure what you should look for then take a look at our easy buying guide. We’ll highlight the important criteria that come with choosing a good trenching shovel, and our 10 best trenching shovel reviews will give you several different brands, styles, and sizes to compare. When it comes to trenching shovels, taking your time and finding the best shovel for your needs can pay off in the long run. You may spend a little more initially, but it can work out. However, there are a few key things to look for in your new shovel. Trenching shovels can come with the blade portion bent at an angle. 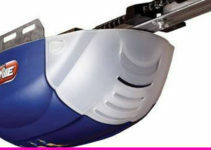 This can make it easier to get down to the bottom of the trenches and remove any loose dirt, rocks, or debris. It’s especially helpful in slightly deeper trenches where you may have to bend to reach the bottom. Trenching shovel blades can range in length and width, and you want to ensure that the shovel you choose has a blade size that is comfortable for you. Generally, the larger a person is, the less difficulty they’re going to have with a wider and heavier blade. If you’re planning on digging finer or smaller trenches, a smaller and more narrow blade would be a better option. A lot of trenching shovels have either an O-ring or a D-ring shape at the end of the handle. These wide areas can give you a better place to grip so you can use and maneuver your shovel easier. If you have a straight handle, look for one with a rubber area that lets you hold on to because this will provide an additional comfort layer for your hands. You’ll quickly notice that trenching shovels have several different handle mediums. It’s not uncommon to find handles with steel or other metals, fiberglass, or ash wood. These three mediums are considered to be very strong and long-lasting. You want a handle that isn’t going to give or crack when you use it, so the strength of the materials is very important. Likewise, the shovel’s blade should be made out of a durable metal like high-quality steel. Another feature to look for is a powder coating because this helps to add another layer of protection to your shovel. Different trenching shoves have different head shapes. Some are designed to cut through the soil and slice through tree roots while others are flat or feature a more rounded head. You have to think of what type of trenches you’re planning to dig and how the head will handle them. If the trenching shovel is from a reputable brand, it’ll most likely have some sort of warranty. Ideally, you want a shovel with a lifetime warranty. This means that you can quickly and easily replace your shovel in the event that it breaks or succumbs to natural wear and tear. If you can’t find a lifetime warranty, a limited warranty is another viable option to look into. This trenching shovel has a slightly wider design, and it is made out of heavy-duty 14-gauge steel for durability. The steel head is attached to a durable fiberglass handle, and this handle is designed to last through a variety of uses without a problem. The handle has a slightly longer design so you won’t bend or flex as much when you use it, and it comes with extra cushioning for a comfortable grip. The handle and head won’t flex when you use them, and this makes handling dirt, clay, and rocks a quick and easy task. This trenching shovel comes with the choice of three, four, or five-inch heads so you can customize it to fit your needs. It is made in the USA with commercial-grade materials to ensure the shovel’s durability and longevity. This shovel features a closed back design that doesn’t allow for debris to build up when you’re using it. It is made out of 14-gauge steel, and this durable material limits how much it flexes. You get a limited lifetime warranty, and the tough fiberglass handle stands up to wear and tear extremely well without cracking. 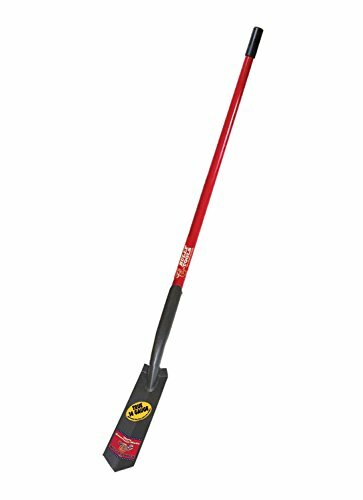 You’ll get a v-shaped head with this trenching shovel, and it’s bright red design ensures that you’ll be able to find it quickly and easily. It comes with one-inch sides that allow you to pick up more dirt and debris with every scoop. The 12-gauge steel is attached to a four-foot hardwood ash handle, and this shovel comes with a limited lifetime warranty. The handle is also tapered for better gripping capabilities and greater comfort. The shovel also comes with a 35-degree angle on the head that allows for precision work, and it gives it excellent trench clearing capabilities. 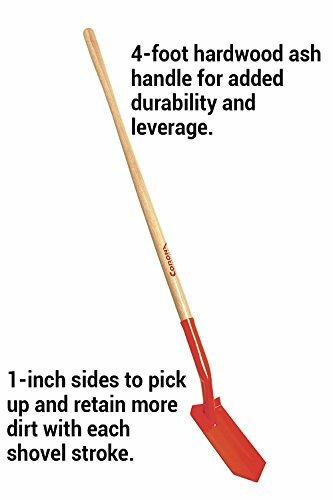 You’ll get a rounded end with this shovel that makes it ideal for digging deep holes, digging up bulbs, or digging trenches. It comes with a welded 14-gauge steel blade and a 16-gauge steel handle for added durability. The handle itself is designed to be extra-large so you can get a secure grip. The shaft is teardrop shaped, and this helps you get a comfortable grip when you use this shovel. It comes with a lifetime warranty against breaking or wear and tear so you can send it back quickly and easily. This sharp trenching shovel is ideal for slicing through thick turf or clay. It has a welded 14-gauge hardened steel blade and a 18-gauge steel shaft that is designed to outlast wooden shovels. You can order between one and five shovels at one time. The blade comes sharpened and ready to use as soon as you unwrap it, and it’s backed by a lifetime warranty against damage and breakage. The D-handle is extra wide, and this lets you control the shovel with two hands when you use it. It’s very lightweight, and it weighs less than five pounds. You can choose from a 17, 31, or 35-inch shovel. It has several optional extensions that you can attach so your shovel is multi-use. The shovel also has an extension option so you can extend or shorten it to a comfortable height when you use it. The handle and the shovel are made out of high-carbon steel, and it is resistant to wear and damage. The handle comes covered in a durable rubber so you can get a firm but comfortable grip. It folds up so you can easily fit it into a small carrying pouch. This lightweight and compact trenching shovel folds down for easy storage. It features a tri-fold design that makes it easy to take it with you when you go. The shovel’s head and the handle are made out of durable steel, and this stands up to wear and tear very well. 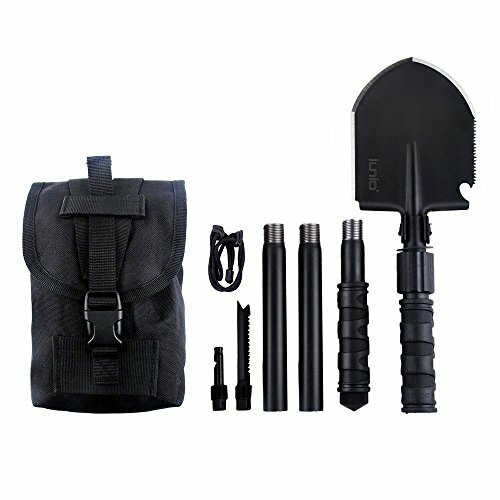 You get a nylon carrying case with this shovel, and it includes gear loops so you can pack everything in one case. It weighs in at just under two pounds, and the D-handle design is wide enough to allow you to get a secure but comfortable grip. You can choose from a three to a six-inch blade with this trenching shovel, and you get a 14-gauge steel head and a fiberglass handle. 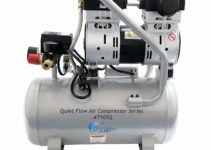 The handle is reinforced with resin to withstand up to 400 pounds of pressure without a problem. It comes with a rivetless crimped steel collar to attach the handle to the shovel head for added durability, and there is a protective sleeve over the handle to save it from damage and wear or tear. It weighs just over three pounds, so it’s easy to use and manipulate. This shovel comes in a 48-inch long design or a 32-inch long design. The shovel head has saw teeth on either side so you can cut through thick turf, weeds, and debris quickly and easily. It’s easy to lift and use due to the fact that it weighs only four pounds. When you buy this shovel, it comes with a lifetime warranty so you can replace it quickly and easily. It’s made out of solid carbon steel with a grey powder coating, and the handle features a rubber top so you can get a solid grip. This shovel comes in four different size options ranging from a standard size up to extra large. 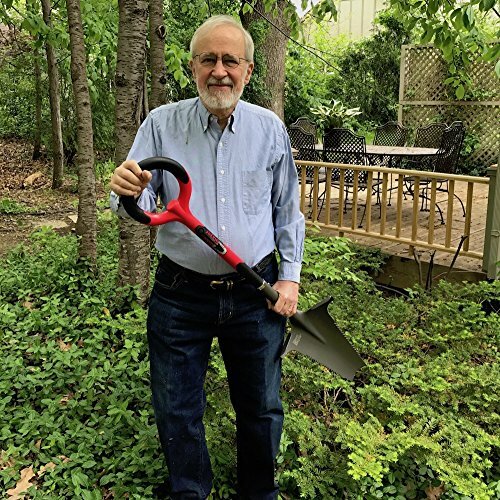 The end of the shovel is fashioned into a sharp inverted v design that cuts through sod and roots quickly and easily. The edges of the shovel contain small notched saw teeth, and the shovel head gradually gets wider as it gets farther from the tip. The top of the shovel’s head has slightly raised walls to prevent soil build-up. You also get an O-ring handle that gives you more gripping room, and it’s covered by a durable rubber. 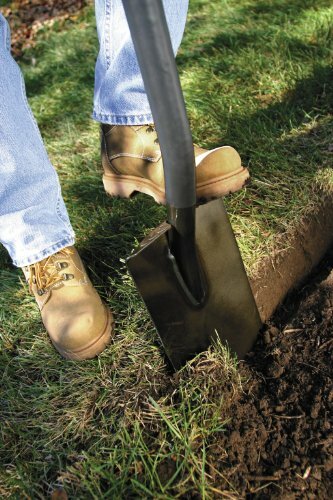 Your trenching shovel should be durable enough to stand up to everyday use or wear and tear. It should also be lightweight enough that you can use it without additional strain. No matter what trenching shovel you choose, our buying guide and reviews give you a good place to start your research.